2003 Thunderstorm & Tornado Stats - Ontario Storms Site! F? = easily confirmed via photos/video, no E.C. confirmation. Aug.28 Thanet Lake Near Coe Hill. Funnel cloud witnessed. DAMAGE PHOTOS HERE. Aug.21, 20:45 Orr Lake North west of Barrie on hwy.93 in Simcoe County. Roof of house ripped off, large trees snapped mid-trunk. Aug.07, ? Chatham-Kent F? Shown on "CFPL-TV" - said to be on ground for about 5 minutes. No more information given. Jul.11, 10:30 Elmvale F0 Supercell with hook echo / meso that crossed the St. Lawrence near Morrisburg (w. of Cornwall) Unknown damage. Jul.4 Red Lake (located NW of Dryden in north western Ontario) Dave Sills of EC writes ..."The MNR is mapping out damage from what appears to be a tornado. A long swath of conifers several hundred metres wide levelled, and a photo of a funnel cloud to boot! I'll be writing up that report as well and should have something on that soon." Jun.29, 17:00 Rockford F0 (south of Owen Sound) House damaged - corner of house missing, can see inside the house from the outside, tree lodged into another wall, trees uprooted. Confirmed by Environment Canada. May 1 Tecumseh F1 Tornado struck early in the morning, downing trees and power lines, damaging houses and destroying a few horse barns. Before only a colour was used to designate a severe thunderstorm warning, but many times a warning was issued accompanied by only a weak storm. So in previous years I've kept records it was hard to tell if the storm was in fact severe just by looking at the table. This year an "X" will be placed into the box if a warning was issued by Environment Canada but no severe t-storm or tornado actually occurred. Warnings are defined as "imminent or already occurring" and I wish in the future E.C. would abide by this. Imminent of course meaning, it *IS* going to happen. Not a chance it's going to. That's what watches are for. JULY 31st - Severe thunderstorm warning issued for northern Niagara/St. Catharines - there wasn't even a storm. AUGUST 10th - Severe thunderstorm warning issued for northern NIagara/St. Catharines - no storms at all, radar shows clear over all northern Niagara. AUGUST 21st - HUGE storm - strongest of the year, Niagara not under a watch. Niagara issued warning after storms were already in the US. Apr.04 00:05 30,000 -2C and raining that frozen "Ice pellet" stuff. 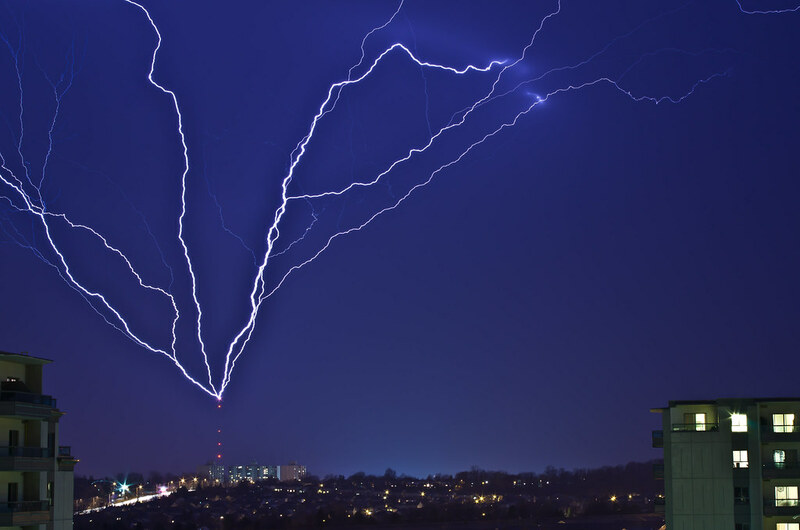 Bright lightning flashes with booming thunder. Severe thunderstorm warning issued, unfortunately it was a fairly weak storm like the others this day. May.05 23:00 30,000 Weak storm, light rain. 14:30 20,000 Weak. Light thunder, no visible lightning, light rain. May.29 15:45 30,000 Temps went from about 27C to 14C in 30 minutes. Moderate storm with localized areas of rotation. Moderate rain/winds, continuous thunder, moderate visible lightning. Jun.04 15:45 30,000 It rained pretty good for awhile, and had some nice loud low-rumbling thunder that was shaking the windows. Not much visible lightning, light winds. Jun.08 10:00 35,000 Severe t-storm watch issued but I missed most of it. From the parts I saw it was moderate in strength. Jun.29 10:30 30,000 Some loud thunder but relatively weak otherwise. Jul.05 18:00 35,000 Very low and dark cloud base with shear. Light thunder/lightning, moderate to strong rain. Most of the heavy activity passed to the north. Jul.07 05:35 30,000 Weak storm but provided much-needed rain. Light thunder/lightning/winds. Jul.15 07:30 35,000 Niagara was under a severe thunderstorm watch, but there wasn't much thunder or lightning, but the winds and rain were VERY strong. Funnel cloud shown on the news in Niagara Falls. Jul.24 19:15 30,000 Light rain, no wind, weak thunder/lightning. Jul.27 07:30 30,000 Light rain, wind, weak thunder/lightning. Short lived. Aug.05 14:20 30,000 Weak storm, short lived. Aug.06 17:30 25,000 Weak storm, short lived. Aug.16 09:00 25,000 Weak storm, short lived. Aug.21 10:45 50,000 HUGE storm system with NON-STOP lightning. Only moderate winds but very hard rain. Click link for photos and info! Aug.26 05:30 35,000 Nice lightning, weak thunder. Moderate rain, light winds. Sep.15 22:30 20,000 A bit of lightning/thunder, light/no wind, light rain. Nov.12 18:30 35,000 Very heavy downpours, moderate (but sometimes close!) lightning/thunder. No wind. 20:00 30,000 Strong downpours, light thunder/lightning, moderate winds.